...that the Exo Stranger is strongly implied to be Elsie Bray? ...that the Awoken were transported to the Distributary after they were caught between the Darkness and the Light? ...that the Exotic weapons Hawkmoon, Monte Carlo, and The Fourth Horseman were exclusive to PlayStation consoles before September 15, 2015? "Vex encryption. Unbreakable? Ha, so they say. "This article does not have enough or has no inline citations. You can help Destinypedia by adding citations. For more information, see the Citation Policy. Gaurog, Fatesmith of Incaru is one of three Hive Darkblades, along with Alak-Tor, Fatesmith of Incaru and Ba-Kuur, Fatesmith of Incaru, that protects Dûl Incaru, the Eternal Return in The Shattered Throne. 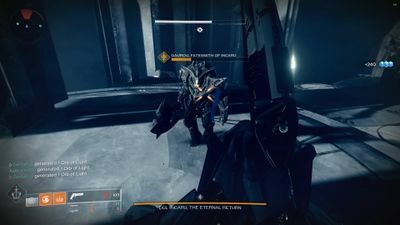 He and the others attempt to allow the witch queen, Savathûn, the access the Distributary, but was killed in doing so.